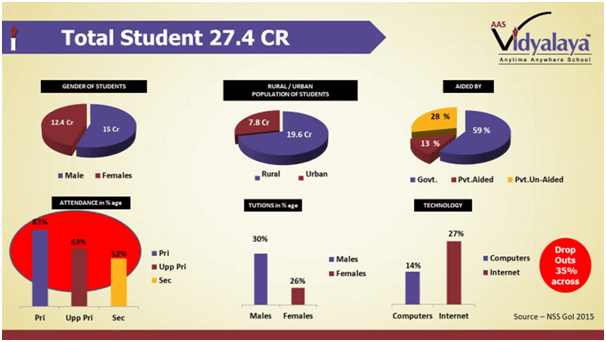 The above charts depict clearly that out of 27.4 crore of the country’s student population, the attendance in secondary school is only 52% ( as per the chart circled in red), the school drop-out rate being 35%. According to Census Data, 8.4 crore Indian children don’t attend school. Poverty, lack of availability and accessibility are the major reasons why children drop out of school. While the government’s emphasis has been majorly on providing primary education to promote literacy in India, there has been little focus on secondary education, which is imperative for skill development. AAS Vidyalaya aims at making secondary education available and accessible to students across the country, harnessing the power of smartphone and internet penetration in the country. AAS meaning hope in Hindi, stands for Anytime Anywhere School and is the brainchild of Mr. Vikas Kakwani, an IIM and IITian, who proclaims himself to be a product of education. AAS Vidyalaya is a virtual school – a mobile app, built for millions of students who cannot go to school, in order to bring the school to them. The Social School operates exactly like a regular school with a dedicated class-teacher, timetables, subject periods and regular assessments. “The idea is to create a virtual school available for everyone- a school ‘For the People, By the People’”, says Vikas Kakwani who believes that the only way India can benefit from its demographic dividend is when everyone in the country is educated.